This is a list of commercially released videos/DVDs that may be of interest (i.e. they have some 'Stanley' related content). If I've missed any, please get in touch via the Contact page. There are also some great clips on 'youtube' and I'll be adding an article on these at some point, as well as some of the various films which are sadly not available, and known appearances on 'Cumberland Highlanders' TV show etc. Reissued on DVD (Shanachie 605) 2005 together with the 'Rainbow Quest' show featuring Doc Watson. Is a 43min B&W TV Show filmed in Baden Baden, Germany in March 1966, at the start of their European tour, and features The Stanley Brothers, Cousin Emmy, The New Lost City Ramblers, Roscoe Holcomb and Cyp Landreneau's Cajun Band. Features The Stanley Brothers as guests on a B&W 1963 Don Reno & Red Smiley TV show. The Stanley Brothers are featured on 5 songs. [4} Features In The Pines from the same set as [3} plus two 1993 Ralph Stanley perfomances form the Ronnie Reno TV Show. In addition to the DVDs / videos listed below, there is also a 1979 Bluegrass Festival Film, 'That's Bluegrass' available on download for rent or purchase from vimeo.com. This features two tracks with the Charlie Sizemore/Junior Blankenship line up and an interview with Ralph. Also featured are Jimmy Martin, Lester Flatt and The Knoxville Grass. VHS tape featuring a 34min perfomance with Sammy Adkins on lead vocal. Probably c1989. Banjo instruction tape, originally on VHS, but reissued on DVD in 2005. Originally on VHS, reissued on DVD-R 201?. is a 2xDVD / 4xVHS release covering the whole gamut of 'Roots' music. Ralph briefly appears playing Little Maggie from Oct. 2000 and in contributes a little to the 'talking head' dialogue. Banjo instruction DVD, featuring Steve Sparkman and James Alan Shelton. Guitar instruction DVD, featuring James Alan Shelton & guest George Shuffler. 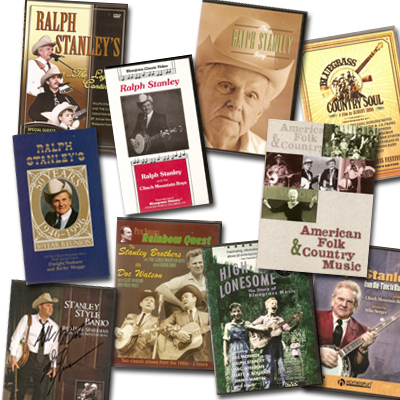 amd [3} are DVD-R releases of an interview with Ray and Melvin Goins by the International Bluegrass Music Museum as part of their oral history projecr. The Goins Brothers also perform a few songs.